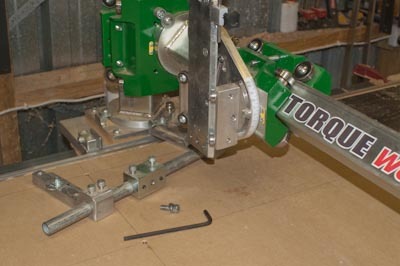 After raising the MDF (sacrificial) tabletop on the Torque Workcentre to the height of the cast iron router table, I was finally at the point that I could consider the best way to attach the Incra LS Positioner which is secure, easily removed and doesn’t consume too much of the TWC working area. More on that later, but it came up that I needed some holes drilled, and given I hadn’t actually tried out the X-Y radial arm drill concept of the TWC, this was the perfect opportunity. Step one was removing the router (which happens to still be using the circular saw mount). I had already taken off the router for another job, and removed the copy attachment, so all that was left was the saw mount itself. It is retained with a single hex bolt. 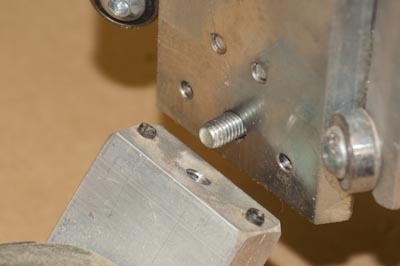 There are two locating/indexing pins either side which prevent the mount from rotating around the central bolt. 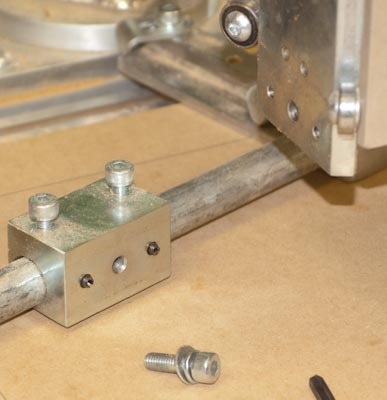 It is a very simple concept, with the bolt passing through the carriage into a threaded hole in the tool mount. The locating pins can be easily seen here. Next, the drill mount is simply screwed into position. 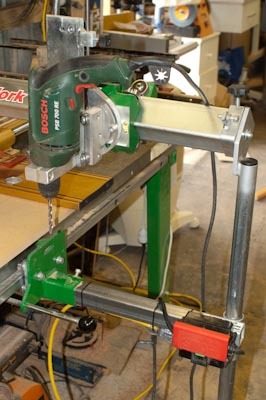 And there you have it – as easy as anything – an X-Y radial arm drill. It has significant range, and sadly, even the amount of plunge available puts my dedicated drill press to shame. I am seriously tempted to think about the laser currently located on the drill press, whether it would be even better relocated to the Torque. I probably won’t, but it bears consideration. As a drill press, this works very well, and if you want significant height, this has more capacity than a typical dedicated drill press. Never mind the massive 900mm (or even 1300mm) distance from the drill bit to the upright. Find a drill press ANYWHERE that has that range!!!! The drill has X, Y, Z movements, as well as rotation around all three axis. Unbelievable range of movements really (and that range is the same for the router obviously). With the aid of a ruler to ensure distance between hole centres remained consistent, these holes are in a perfect line. As you’d expect, I’m looking at ways to be able to do something like this sans ruler- most likely using some of the Incra rails. 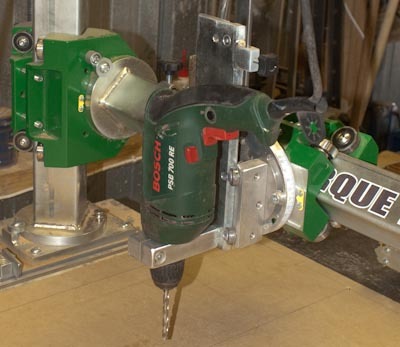 This is what the holes are for – securing down the Incra Positioner. One idea I had was to use T Nuts secured to the underside, and these threaded knobs from the top. Unfortunately I didn’t have nuts that had threads that matched the knobs, so in the meantime I have used some standard bolts from underneath. Looking at this photo now while writing the article, and I am starting to wonder if I still even need this anodised piece at all, or whether I should instead consider returning to Incra’s original intention – to have the actual positioner secured down directly. Hmm – even more thought required! Onto a mod directly on, and for the TWC. I originally had the intent to use this switch (originally a Triton switch) for the router table (affixed to the right end of my TWC, and has the Incra Fence discussed above), but as I recently mentioned, I instead went for the Pro Switch sold by Professional Woodworkers Supplies that has a no-current release built in. I was using the drill on the TWC, and a thought crossed my mind (again) that it would be nice to have a convenient place to plug the different tools into. My first thought was to mount a power board, until my glance happened upon my Triton switches. 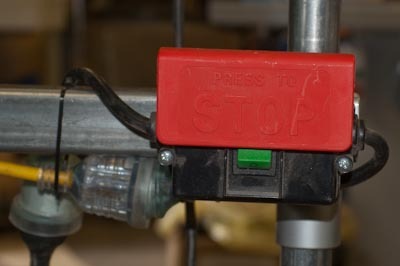 Hmm – easy to plug each tool into as it is mounted to the TWC, the ability to turn the tool on by whatever means, then a single, consistent place to start and stop it, and as an added safety benefit, the ability to knee, nudge, kick (whatever) the switch off while both hands are supporting the workpiece and/or tool. Perfect! The switch is mounted on the lower support arm (as can be seen), so it is about thigh-height. It travels up and down the x-axis with the tool, so is always in optimum position to be able to kill the tool when required. Don’t be concerned about the messy background – partly it is flash shadow, partly they are cables I need to find more permanent arrangements. I’m considering the main power cable to be run between two pulleys, with a light weight between to take up slack as the arm is slid along the x-axis. When installing a dust collection system, you’ve spent good money on the biggest collector you can afford, and then are trying to get it to maximise its range to collect from as many machines as possible over the longest distance needed to maintain the shop’s machine layout. One very common aspect of this is to install blast gates so that machines that are not currently being used are not unnecessarily having air drawn from them, decreasing the amount of suction at the tool in use. 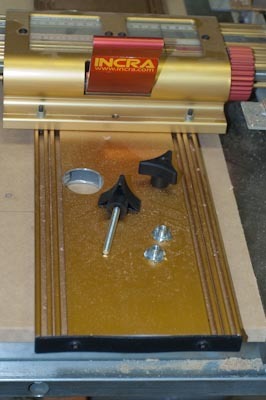 There are a number of different blast gates available, with one of the most common ones on the market being the plastic 4″ – 4″ blast gate. They are a low cost solution that seemingly works well in shops across the country, and world (I guess). Don’t know who designed the original, that is now so often copied, but all I can say is…. it’s bloody stupid! The problem: the bottom corners of the gate (in the channel where the gate itself slides) quickly get filled with crap, and once that happens and the shavings / dust etc get packed in there, the gate cannot ever close properly again, leaving a permanent leak through every gate that is (theoretically) closed. Here is a very typical blast gate, and in the very typical state of being so blocked in the lower corners that this is as much as it can close. Looking at the opening this leaves, you can see that it wouldn’t take too many gates in this state that the amount of leakage would add up to being the equivalent of a fully open gate. A complete waste of suction. One tip I’ve come across in the past, is to cut off those lower two corners, so the gate effectively becomes self-cleaning. When the gate is closed, the slide blocks the resulting holes. When it is open, there is a minor additional leakage caused, but nothing like the loss from a single, unmodified closed gate. Here you can see the protruding corners of the blast gate slide. And the small hole that now exists in the corners. I’m not sure if this mod is the best way (or the neatest) – I’m sure I saw (or at least read) about this mod in a mgazine somewhere! So that is the basic concept to the modification, and it does work. However, it isn’t the neatest version, and so my amendment to the concept is to drill the corners out, allowing the slide to continue to push dust clear, but better maintaining the overall physical (and visual) integrity of the blast gate. 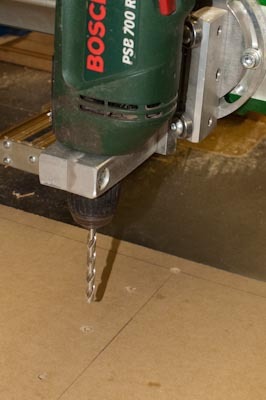 During the drilling of the corner, the dust that is packed in the corner is immediately apparent.